It really does seem more like hydrovolcano than other things and it might've been some city after it died down a bit. If you watch the whole video it says that it has a water source in it. Anyone else have that kind of eye for this "eye"? Almost forgot to mention about the other such circular mark at the west side of the big one that is also such a hydro volcano, if you take notice how the rivers flow in all directions outwards from it. This is a close-up of the iris of the "Eye of the Sahara," which the Egyptians called the "Eye of Horus" or "all-seeing eye." Nothing to do with Atlantis--wrong side of the planet. In google earth (for me atleast) it looks same like in the video. Different looking, just a circular shape much like volcano, but in this case I think it is died down hydro-volcano, sort of like geyser, but with cold water just shooting out off the earth with high pressure, thus the rivers around it. I wonder what it would look like when it was in action. In google earth (for me atleast) it looks same like in the video. You have to zoom out to see the "eye." It is HUGE--185 miles, 300km, from side-to-side. Like the figures on the Nazca plains, quite easy to see from orbit. Different looking, just a circular shape much like volcano, but in this case I think it is died down hydro-volcano, sort of like geyser, but with cold water just shooting out off the earth with high pressure, thus the rivers around it. I wonder what it would look like when it was in action. A soil analysis shows magma deposits... now that could have been a volcanic crater that later started spewing water, eroding the system, but geysers do not tend to have a ring pattern around the spout (see geyser fields at Yellowstone). The hydro-volcano model has been popularized recently by the Mormons, with their "UM" model (Universal Model). I actually spoke with the author of the theory a couple of times, since I live in the gold buckle of the Mormon belt. I pointed out a number of flaws in his theory and provided hard evidence, which was ignored. It seems the vested interest here is, like most Mormon projects, recruitment to their religion. very interesting, thank you! could be a dragon's eye. but at least from a lizard. 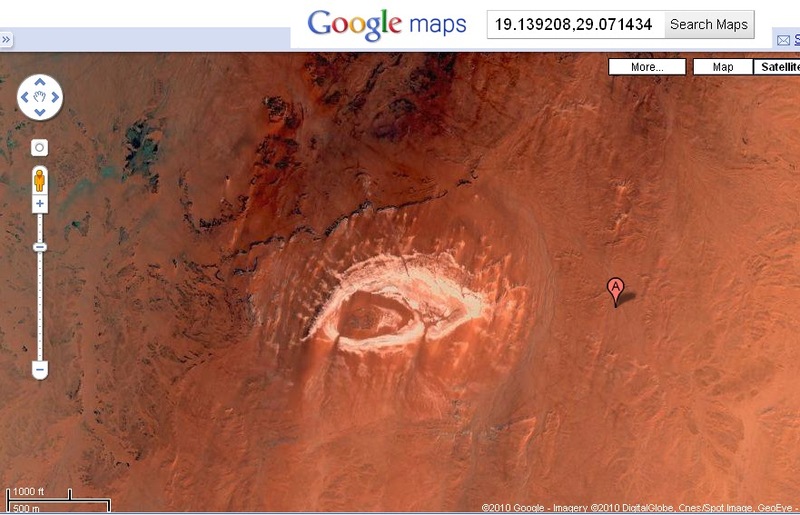 Given the size of the structure, like the images of the Nazca plains, that eye would easily be seen from orbit. Though this "lizard" is probably a bit more Sumerian than Inca. The sand covers up features (changes all the time), but it even has the "descender" lines under the eye... cannot be a coincidence. Makes you wonder this eye is used so heavily by the NWO. I know and I saw another much smaller one right next to it to west and a bit south as well. That one looks more like just hydro-volcano, found here "21.016238, -11.834661"
It seems to have different layers of rock some softer than others so "normal" volcano first then hydro one when volcanic material died down after it got more water than it bargained for, I wonder if there are alot of salt (sodium, potassium etc.) around the place also, when going downstream. Perhaps those white plains in the upper left corner of the picture above are salt flats. This picture seems very small, zoomed in can be seen from the satellite images in google maps at those coordinates above. oh yes, with this turn it becomes very clear. A 2011 multianalytical study on the Richat megabreccias concluded that carbonates within the silica-rich megabreccias were created by low-temperature hydrothermal waters, and that the structure requires special protection and further investigation of its origin downstream. But I cannot help but notice that the possibility that this was an artificial structure is never even considered... especially since there is only ONE Richat structure on all of Earth and it is used symbolically all over the world by Secret societies, Royalty and New World Order. Here's what I thought of Pope Benedict XVI... always some hidden truth. There is a discussion on Dragons here. If you are making a reference to the ANNUNAKI, "amphibian eye" would be more appropriate, as the depictions of the gods that survive tend to show them as aquatic, upright amphibians with large, thick tails. Not very dragon-like--more like a sleestack. Actually, the description of angels in the Apocrypha sounds more like dragons, with them flying around like pteranodons biting people and making them sick. You know, I am thinking that could it be ancient nuclear test site or just bombed some city that was in there? You have breccia there which is large rocks mixed with small stones or sand, that are cemented together to form bigger stone/rock. And I mean the "real" nukes that were possible when gold was radioactive. Perhaps the explosion happened deep underground opened some canal for water to be released through the dig hole, later on. Such an explosion might be powerful enough to fuse rocks together with each other, to melt them even, and they have found black rocks in there as well. I am no expert on the ancient nukes that were actual ones rather than modern nukes which are more like regular chemical reaction explosives. What do you think about that kind of theory? If you are making a reference to the ANNUNAKI, "amphibian eye" would be more appropriate, as the depictions of the gods that survive tend to show them as aquatic, upright amphibians with large, thick tails. Yes, I meant it that way. in the Fifth Age of the Dragon. In my summer nights at the campfire, I discovered this symbol also in the starry sky, beginning in the early evening with Arktur. Even before it really gets dark and the majority of the stars are visible all around, one star after the other rises for this very geometry. I sense a connection in all this, but I cannot give any explanation for it. gaze upon the mountain of influence - pay homage to the Great Council of the Dragon." What I've noticed in mythology, is that you cannot translate word-for-word. Latin, like English, has phrases that have specific meaning that is not the sum of their words. Particularly when it comes to magical texts. You have to put yourself in the time/place of the person writing the material, in order to understand it. For example, "water under the bridge" has nothing to do with water or a bridge... it refers to a past issue that has been resolved and is no longer significant.